As an increasing number of states weigh the legalization of physician-assisted suicide, a new paper released by the Charlotte Lozier Institute (CLI) elaborates the arguments against the practice, citing numerous abuses. Award-winning author Wesley J. Smith examines how assisted suicide impacts the states and countries where it has been legalized, particularly legalization’s effect on medical ethics and patient care. Smith is a senior fellow at the Discovery Institute’s Center on Human Exceptionalism and a consultant to the Patients Rights Council. “Assisted suicide and euthanasia would profoundly change—are profoundly changing—the ethics of medicine and cultural views about the value and worth of people with difficult lives, whether caused by illness, disability, or mental anguish. And it is hurting many of those who strive to cope with these conditions, but repeatedly are told that their lives are not worth protecting from suicide, and indeed that, if they want to die, society will allow doctors to provide the means. A disabled rights campaigner won a legal victory against Director of Public Prosecutions Alison Saunders over the law on assisted suicide. Former theatre manager Nikki Kenward, 62, who is confined to a wheelchair, was allowed to challenge her ruling last year that made the prosecution of healthcare professionals who help people take their own lives less likely. Mrs Kenward, of Aston on Clun, Shropshire, who is backed by her husband Merv, argued at the High Court in London that the decision was unconstitutional. Lord Justice Bean, sitting with Mr Justice Hickinbottom, said she had an “arguable” case and that she could seek a judicial review into the ruling. A full hearing into the issue of Mrs Saunders’ decision will be held later this year. A terminally-ill Wellington lawyer trying to clarify the law on assisted dying has accepted a judge’s ruling to allow interest groups to join her court case. Lecretia Seales, 42, was first diagnosed with a brain tumour in March 2011 but with her health deteriorating, she petitioned the High Court in Wellington to uphold her right to die at a time of her choosing with the assistance of a doctor. On Friday, Justice David Collins decided the lobby groups Care Alliance, Voluntary Euthanasia, and the Human Rights Commission would be allowed to have a say in her case. Their intervention would give them the right to present additional evidence to the court under strict conditions. The case was due to start on May 25. A post written on her behalf on her blog said the groups’ participation would be so strict and on such specific terms, they could only reasonably respond to her circumstances. Gerbert Van Loenen, a Dutch journalist, once saw Holland’s legalization of euthanasia as one of that country’s crowning achievements. These experiences led Van Loenen to wonder. Where did this attitude come from? How did it become so widely accepted that people living with disability or illness are better off dead? Is the legalization of euthanasia in the Netherlands part of the cause? Do You Call this a Life? Blurred Boundaries in the Netherlands’ Right-to-Die Laws is the result of his research. The book is an objective and exhaustive exposition of what is happening on the ground in the Netherlands with respect to euthanasia. Van Loenen traces changing attitudes through the media, medicine and the courts over time. He finds that the cultural acceptance of euthanasia has expanded alongside Dutch laws, each step facilitating the next. Groups for and against euthanasia have won the right to participate in the hearing of a 42-year-old woman wanting to die. Lecretia Seales, a lawyer who has terminal brain cancer, is asking the High Court at Wellington for a declaratory judgment that would protect her GP from prosecution if, and when, her doctor assists her to die. Ms Seales argues she has a right not to be subjected to cruel, degrading or disproportionately severe treatment under the Bill of Rights Act. The Care Alliance, the Voluntary Euthanasia Society and the Human Rights Commission sought approval from the High Court on Tuesday to participate in the hearing on May 25. In a decision yesterday, Justice David Collins said he would allow it with stringent conditions to prevent delays, because it may assist him to make a decision. FAMILY MATTERS: EUTHANASIA – ARE YOU READY FOR THE DEBATE? Euthanasia (or assisted suicide) has certainly been in the media a lot lately. There is a strong push for it to be decriminalised in NZ as has happened in a few overseas countries. Are you ready for this debate? 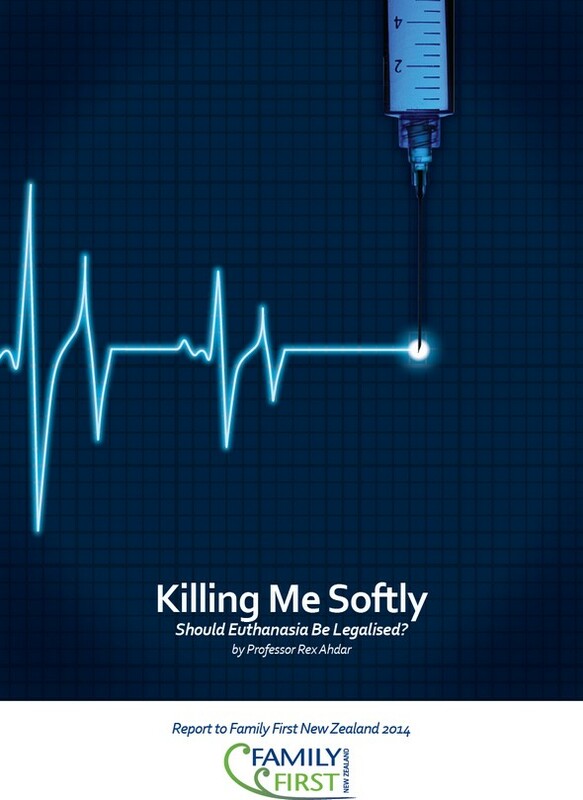 Do you know the key arguments for euthanasia and how to counter them? Can you define ‘euthanasia’? (There is a lot of misunderstanding over the definition, which is further confusing the debate.) Why should we oppose euthanasia? What does the overseas experience show? Please – take just a few minutes to watch our latest episode of Family Matters. We need your voice and energy on this important family issue, as well as ours. Thank you for standing with us as we speak up for families. A group opposed to euthanasia says allowing terminally ill woman Lecretia Seales to take a lethal dose of drugs would have far-reaching impacts on New Zealand society. Ms Seales, 42, is dying from brain cancer and says she has a right to end her life with medical assistance before her suffering becomes unendurable. In a hearing in the High Court at Wellington today, three groups are seeking to join Ms Seales’ case and have their say in court. The Human Rights Commission, Care Alliance Trust and Voluntary Euthanasia Society want to weigh in on the legal challenge. Care Alliance, a coalition opposed to euthanasia and assisted suicide, said groups that worked with the elderly, infirm and in the field of suicide prevention had to be heard. Groups opposed to voluntary suicide say a terminally ill Wellington lawyer’s bid to legally end her own life sets a dangerous precedent which will harm society’s more vulnerable people. The Care Alliance wants to be heard in the case of Lecretia Seales, the 42-year-old who has terminal brain cancer and is asking the High Court to uphold her right to die at the time of her choosing. She has asked the court for a declaratory judgment that would protect her GP from criminal prosecution if, and when, her doctor assists her to die. Ms Seales argues that under section nine of the New Zealand Bill of Rights Act, she has a right not to be subjected to cruel, degrading or disproportionately severe treatment. The case will be heard next month between Ms Seales’ lawyers and the Attorney-General. The Human Rights Commission and two other groups want to join a legal challenge by a terminally ill woman seeking the right for a doctor to help her die without criminal prosecution. Lecretia Seales, 41, is dying from brain cancer and believes it’s a “fundamental human right” to be able to choose to end her life with medical assistance, if she wants to, before her suffering becomes intolerable. In a legal first in New Zealand, the senior legal and policy adviser at the Law Commission filed a statement of claim in the High Court seeking a ruling to determine whether her GP could lawfully administer a lethal dose of drugs. Assisting suicide is a crime punishable by up to 14 years in prison but Ms Seales’ case relies on the provisions in the New Zealand Bill of Rights Act that protect the rights to not be deprived of life or subjected to cruel treatment. If successful, the bid would allow the doctor to euthanise Ms Seales because of her specific circumstances and would not set a precedent. But a favourable High Court ruling would allow others to follow suit and potentially send a signal to Parliament for further law reform. The case, Seales v the Attorney-General, has been set down for a one-week hearing in the High Court at Wellington next month. But three other parties – the Human Rights Commission, the Voluntary Euthanasia Society of New Zealand and the Care Alliance Trust – are seeking to join the case and have their say in court. Voluntary Euthanasia supports Ms Seales’ position, while the Care Alliance is opposed to assisted suicide and euthanasia. Asked whether the Human Rights Commission supported or opposed Ms Seales’ bid, a spokeswoman said the case raised important human rights issues with implications for many people. With the right palliative care a person with a life limiting condition can live a good quality of life with their dignity maintained and symptoms managed. Assisted dying is a complex subject that raises challenging ethical questions for hospice care. Hospice New Zealand recognises that across society there is a range of different views, and respects the right of everyone to take an individual position. It is our view that the question of whether there should be a change in the law is one for society to consider and for the parliament to decide. Hospice New Zealand does not support a change in the law to legalise assisted dying in any form. Nor do we consider that a change in the law would be in the best interests of the people we care for. It is important to stress that hospices’ always work strictly within the law, which currently means it is a criminal action to help someone commit suicide and may result in prosecution. We believe Government should be investing in palliative care, increasing access to care and support not legalising euthanasia. Only when all New Zealanders have ready access to expert end-of-life care can a balanced debate begin. We support that all New Zealanders have the right to choose where they die. All people with a life limiting condition should be made aware of options for hospice and palliative care, and should be offered an individual assessment of their needs to ensure that appropriate palliative care is being provided. This should be an integral part of advanced care planning. We believe that palliative care should be routinely available to all who need it, and Government should ensure that public funding is made available to increase the availability of palliative care, whether provided by the hospital, at home (by the primary health care team), in residential aged care facilities or in hospices. Family First NZ says that a Research NZ poll on euthanasia misrepresents the real effect of decriminalising euthanasia and is far too simplistic. “By only asking about the scenario of a ‘painful incurable disease’, the poll question misrepresents not only the real effects of changes to euthanasia laws as evidenced by similar law changes overseas as well as a potential misunderstanding of what ‘euthanasia’ really is, but it also belittles the incredible advances in the quality of palliative care in New Zealand,” says Bob McCoskrie, National Director of Family First NZ. “What this poll fails to address is that to allow assisted suicide would place large numbers of vulnerable people at risk – in particular those who are depressed, elderly, sick, disabled, those experiencing chronic illness, limited access to good medical care, and those who feel themselves to be under emotional or financial pressure to request early death. Patients will come to feel euthanasia would be ‘the right thing to do’, they have ‘had a good innings’, and they do not want to be a ‘burden’,” says Mr McCoskrie. “Why did the polling company not also ask ‘Should a depressed person be able to access assisted suicide?’, ‘Should a disabled person who is deemed a burden to their family be able to access euthanasia?’, ‘Should an elderly relative who feels they are a burden on both the health system and also on their family finances be able to access euthanasia?’. These are some of the negative outcomes of a law change and will lead respondents to re-think their response to a law change,” says Mr McCoskrie. A 2009 Massey University poll showed a marked difference in responses depending on whether the word ‘painful’ was included in the question. A poll by Curia Market Research commissioned by Family First NZ in 2013 found that 57% supported the statement “If someone really wants to die, doctors should be allowed to help them kill themselves.” But when they were also asked “If the Government spent more on quality palliative care for people with terminal illnesses, almost no one would die in prolonged pain or suffering”, a majority of 52% supported that proposal and 32% opposed. The majority of the medical profession and national medical associations around the world have been resolutely against the introduction of voluntary euthanasia or physician-assisted suicide.